Founded in 1992, Logical Alternative is a business consulting, IT services, website and custom application development firm that, at its core is Evelyn and Melissa Dickinson, partners and the company’s owners. “Logical Alternative strives to provide small businesses and nonprofits the same level of IT and design resources that larger businesses have access to,” explains Melissa (she/her). 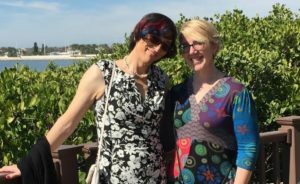 Together, Melissa and Evelyn have been busily building online resources for the transgender and gender non-conforming community in Seattle. They are the website developers for the King County Transgender Resource Guide for 2017. “One of the things that struck me when I came out last year as a transgender woman,” explains Evelyn (she/her), “was that there was no online single point for the transgender community for the greater Seattle area that is kept up to date. Everything’s sort of word of mouth.” Logical Alternative seeks to change that. “I’m on a mission,” says Evelyn. Evelyn hopes that her visibility as a trans business owner can inspire others. This entry was posted in Blog and tagged Conference, genderodyssey, GO2017, scholarships. Bookmark the permalink.